Just the Facts: Dallas Will Replace Chicago as 3rd Largest Metro in U.S.
Posted: October 3, 2016 | Author: Living Large in DFW | Filed under: Dallas is Growing, Dallas Life, JUST the FACTS, Relocation & Area Information | Comments Off on Just the Facts: Dallas Will Replace Chicago as 3rd Largest Metro in U.S.
Dallas Will Replace Chicago as 3rd Largest Metro in U.S.
Cities, noted René Descartes, should provide “an inventory of the possible,” a transformative experience—and a better life—for those who migrate to them. This was certainly true of seventeenth-century Amsterdam, about which the French philosopher was speaking. And it’s increasingly true of Texas’s fast-growing metropolises—Houston, Dallas–Fort Worth, Austin, and San Antonio. In the last decade, these booming cities have created jobs and attracted new residents—especially young families and immigrants—at rates unmatched by coastal metropolitan areas. Approximately 80 percent of all population growth in the Lone Star State has been in the four large metropolitan areas since 2000. Texas now boasts two of the nation’s five largest metros, the first time any state has enjoyed that distinction. At its current rate of growth, Houston could replace Chicago as the nation’s third-largest city by 2030, and the Dallas–Fort Worth region could surpass Chicagoland as the nation’s third-largest metropolitan area by the 2040s. Overall, Dallas–Fort Worth and Houston have emerged as the nation’s fastest-expanding big-city economies. Between 2000 and 2015, Dallas–Fort Worth boosted its net job numbers by 22.7 percent, and Houston expanded them by an even better 31.2 percent. Smaller Austin (38.2 percent job-base increase) and once-sleepy San Antonio (31.4 percent) have done just as well. New York, by way of comparison, increased its number of jobs in those years by just 10 percent, Los Angeles by 6.5 percent, and San Francisco by 5.2 percent, while Chicago actually lost net employment. And the Texas jobs are not just low-wage employment. Middle-class positions—those paying between 80 percent and 200 percent of the national median wage—have expanded 39 percent in Austin, 26 percent in Houston, and 21 percent in Dallas since 2001. These percentages far outpace the rate of middle-class job creation in San Francisco (6 percent), New York and Los Angeles (little progress), and Chicago (down 3 percent) over the same period. Texas’s sprawling metropoles are growing Science, Technology, Engineering, and Math (STEM) jobs more rapidly than the Bay Area—and far faster than New York, Los Angeles, and Chicago. Since 2001, STEM employment in Austin is up 35 percent, while Houston has increased these desirable positions by 22 percent and Dallas by 17 percent. STEM jobs have increased 6 percent in San Jose and 2 percent in New York over this same period. L.A. has seen no STEM growth; Chicago has lost 3 percent of such positions. Dallas Will Soon Replace Chicago as the Business Center of the Mid-U.S. When Toyota recently moved its headquarters from Los Angeles County to the Dallas area, for example, executives said that the L.A. area’s rising housing prices—roughly three times what they are in Dallas–Fort Worth, adjusted for income—had much to do with it. Dallas–Fort Worth might be the big metro that benefits most from this movement. The typical corporate expansions in the Dallas area—not just Toyota but also State Farm, Liberty Mutual, and Amazon—have included headquarters and back-office centers in the area’s northern suburbs, creating thousands of jobs. As Southern Methodist University scholars Klaus Desmet and Cullum Clark found in a soon-to-be-published study, jobs are shifting from Chicago and surrounding areas to Dallas–Fort Worth in such numbers that the Texas city is increasingly poised to replace the Windy City as the business center of the mid-U.S.
DART is looking to fast-track the nearly billion-dollar Cotton Belt Line rail project more than ten years from its previous projection date. A year ago, DART officials said the Plano to DFW Airport train line would have to wait until 2035. DART now wants to push the project up and have the east-west line operational by 2022. DART has already secured the funding for half of the project and plans to apply for federal funds to pay for the other half. While suburban cities like Addison and Plano support the Cotton Belt Line, not everyone in Dallas is on board. Some business and city leaders are concerned the Cotton Belt Line will impact the plans for a second downtown Dallas trail line. Many now want the second downtown line to be a subway line. “We don’t believe it needs to be an either/or,” said DART spokesperson Morgan Lyons. “They are totally separate projects. We believe we can actually do two separate projects at one time.” Decades ago, DART bought the Cotton Belt corridor train tracks. A few years ago, freight trains stopped using the tracks. All along DART officials say they had planned someday to turn the corridor into a passenger line. That someday is now quickly approaching. DART is holding a series of public meetings about the Cotton Belt project, including Thursday August 25 at the Addison Conference Centre and Monday, August 29th at Parkhill Junior High School in Dallas. A proposed change to the DART line is curving the tracks to actually go through Cypress Waters, rather than much of Coppell. There would be a “Mockingbird Station” type stop in Cypress Waters with retail, restaurants and high density type housing. Dallas Area Rapid Transit wants to expand downtown’s streetcar network and add a second light-rail route called D2 through the central business district. The projects promise to change how North Texans move around the region — and how the long-fought resurgence of Dallas’ urban core takes shape in coming decades. But it remains unclear when and whether the agency can deliver the projects in the way that its own board members, elected officials and the public want. And that’s not just because there are warring opinions about how DART should tackle the expansions. The proposed change would have a second DART line go through the southern portion of downtown near the convention center, city hall and Farmers Market. Home prices in Dallas-Fort Worth are continuing to escalate — rising 9.3 percent year-over-year in May — as buyers continue to gobble up houses. North Texas is outpacing the rest of the nation by more than three full percentage points, with the national rate sitting at 5.9 percent year-over-year in May, according to CoreLogic Inc. on Tuesday, which has a large hub in Dallas-Fort Worth. CoreLogic’s Home Price Forecast indicates the trend of increasing home prices will continue into next year, with prices expected to rise 5.3 percent by May 2017. “It’s amazing it continues to increase that much year-over-year, but the housing market continues to be tight even as there’s more listings in the market,” Ted Wilson, principal at Dallas-based Residential Strategies Inc., told the Dallas Business Journal. “As quickly as it hits the market; it gets gobbled up,” he added. “Home prices have climbed much higher and much quicker than it ever has in Dallas-Fort Worth, which has raised some eyebrows. But it’s still an affordable market.” Wilson said he doesn’t see demand, or home prices, slipping anytime soon. Inventories are expected to remain tight with little construction labor to go around in the region, he said. Nationally, CoreLogic Chief Economist Frank Nothaft said the consistent growth in home prices has been driven by the highest resale activity in 9 years and a still tight housing inventory. The rising costs are forcing some buyers to bring more cash to the table as lenders are unable to finance the full price of a home. Two years ago, when Toyota said it was moving its U.S. headquarters from Southern California to Plano, the announcement made national headlines. The automaker was bringing up to 4,000 jobs and investing hundreds of millions of dollars. With its stature in Japan and beyond, the move validated Dallas-Fort Worth as a business base for international companies. Six months later, officials went to Torrance, Calif., then Toyota’s U.S. home, and held a seminar titled, “Why DFW now?” About 50 Japanese firms attended and a similar program is planned for this fall in New York. “They all wanted to know, ‘What does Toyota know?’ ” said Mike Rosa, senior vice president of economic development for the Dallas Regional Chamber. Toyota has plenty of company here. Kubota Tractor followed a similar path to Grapevine and Trend Micro came a year earlier to Irving. Both are based in Japan and had a U.S. headquarters in California. In 2012, Dallas-Fort Worth had 112 Japanese firms with regional HQs or operations. By April, the number was 164, with 20 additions since last summer. “That’s why we’re seeing more flights between here and Japan,” said John Stich, honorary consul-general of Japan in Dallas. Stich, who tracks the number of Japanese companies here, said air travel connections were a crucial factor in North Texas’ appeal. DFW International Airport has 34 nonstops a week to Narita Airport, outside of Tokyo. Only three airports in the U.S. mainland have more — in Los Angeles, New York and Chicago. American Airlines has applied for a new daytime route from DFW to Haneda. That’s Tokyo’s close-in airport and a favorite for many business travelers. In filings with the U.S. Transportation Department, American and DFW touted the size of this market and airline hub, and the many connections. They also highlighted the growth in Japanese businesses, which generate demand for service to DFW and connecting flights to Latin America. DFW connects more passengers between Japan and Mexico than any other U.S. gateway, according to the filings. And the Haneda-DFW route would offer one-stop service to nine Mexican cities where over 100 Japanese companies have subsidiaries. “DFW is the only gateway capable of attracting the huge traffic between Latin America and Tokyo,” American said its application. In 2012, DFW had 19 weekly flights to Asia; today, it has 52, airport officials said. Passenger traffic to Asia more than doubled in three years. In 2015, it grew 36 percent, over three times faster than total international traffic at DFW. Love Field also has become a major asset in selling the region, Rosa said, because it adds so much competition on domestic travel. Corporate visitors often look out from the chamber’s high-rise office in downtown Dallas and see flights taking off from Love and DFW. They’re impressed by how close the airports are, he said. And that underscores the strength of North Texas for companies that travel regularly.Japanese firms have come to Dallas for over 30 years. Initially, the focus was on telecom, semiconductors and electronics. More recently, Rosa said, there’s been growing interest from Japanese banks, retailers and homebuilders. In 2014, North Texas had almost 10,000 people of Japanese descent; that’s well below the number from India, Vietnam, China, Korea and the Philippines. But Japan ranked No. 2 for international companies in the area, after the United Kingdom and ahead of Canada, according to the chamber. Since 2003, at least 175 Japanese projects have led to $19 billion in investment statewide. And that’s without the bullet train proposed for Dallas to Houston. If that multibillion-dollar project gets built, it would have Japanese technology and investment. The Dallas-Ft Worth Metroplex is now experiencing a net gain of one million people every six years. 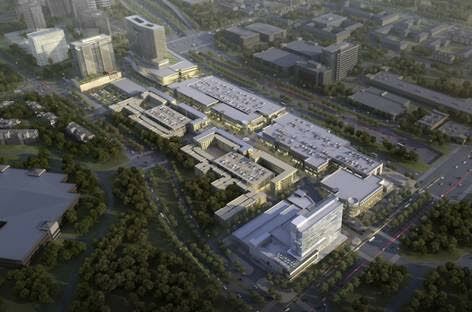 Along with the explosion of the exurbs (towns north of thesuburbs), the in-town Dallas development is booming. 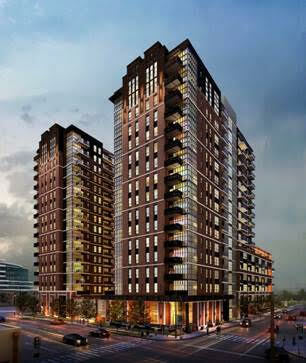 High-rise apartments and condos are announced almost daily in all parts of the city. Pictured below is theLegacy West development in Plano, which along with retail and office there will be hundreds of high-rise apartments and condos. Next is the newly proposed massive high-rise development in Uptown, just north of the Woodall Rogers Freeway and the Museum Tower. 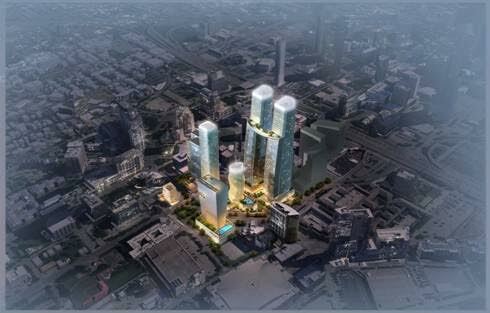 Several announcements recently for Deep Ellum, with new high-rises soon to surround that historical part of the city. Last is the very popular Bishop Arts District in Oak Cliff. 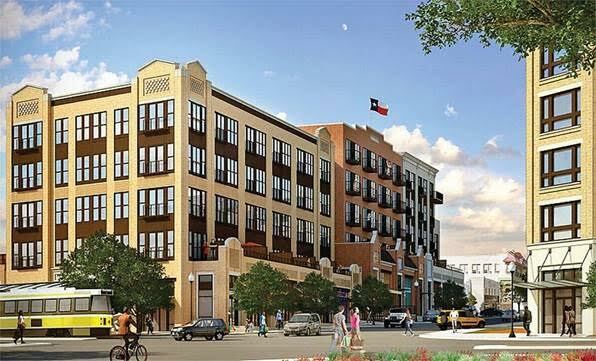 Demand is strong for more development inthe area, and pictured below is the Alamo Manhattan project which has met with approval by the neighbors and the city. This week Newsweek released its annual list of the nation’s top 500 high schools based largely on college readiness. Fourteen North Texas high schools made the list, which takes into account graduation rates and the number of students who are college bound. This year Newsweek also released a list of the top 500 high schools “Beating the Odds,” which are those deemed to have done a good job preparing their students who have significant challenges due to poverty. Texas has 46 schools on that list, including some on the list below as well as Trinidad Garza Early College at Mountain View and the Irma Lerma Rangel Young Women’s Leadership School in Dallas,Dubiski Career High School in Grand Prairie and Richardson High. Rick Reedy High School is one of four new campuses that opened today in Frisco. Opening with ninth- and 10th-graders, the school is the eighth high school for the rapidly growing suburb. And it’s the second part of a four-year plan for the district to open four high schools in four years. Under Frisco’s small-school model, it caps high school enrollment at about 2,100 students. Last year, Frisco opened Independence High School. Next year, Lebanon Trail High School is due to be its ninth. Plans are underway for the 10th — Memorial High School — and the district already has land for high schools Nos. 11 and 12. Student enrollment in the district is expected to increase about 6 percent from last year when school begins Monday. As one of the fastest growing school districts in the United States, Frisco adds about 2,500 to 3,500 students each year. It’s made opening schools a science, publishing guidebooks to standardize the process. With thousands of workers moving to Plano for jobs with Toyota, Liberty Mutual Insurance, FedEx and others, it shouldn’t be a surprise the Collin County town is near the top of home shopping lists. So far in 2015, Plano has ranked fourth among U.S. markets for Internet home on Realtor.com. Melrose, Mass; Columbus, Ohio, and the Denver suburb of Littleton, Col were at the top of the list. “Plano is identified as the country’s 4th hottest zip code so far this year out of 32,000 others across the U.S.,” Realtor.com reports. “Each locale on this list is emblematic of the key trends driving housing this year – healthy local economics, job opportunities and affordability,” Jonathan Smoke, chief economist for Realtor.com, said in the report. “For first time home buyers, these communities provide great opportunities to enter the housing market, build a career, and raise a family; older generations are able to build wealth and enjoy a variety of lifestyles.” Realtor.com says that its Internet home listings in Plano get nearly 1,200 views per month on average, more than twice the views than the rest of the metro area and eight times more than the national average. Great news for everyone out there trying to make a living — which is, you know, everyone. Texas is the best place in the country to do just that. Forbes reported the “The 10 Best and Worst Places to Make a Living in 2015” and Texas topped the list (on the good side). Last year, Texas ranked second, behind Washington. Taking into account average wages, taxes, cost of living, unemployment, and workplace safety, MoneyRates.com ranked the 50 states by livability. For Texas, the very low cost of living amplified the effects of slightly higher wages, and the fact that we have no income tax didn’t hurt. Washington took the No. 2 spot this year, followed by Wyoming, Virginia, Illinois, Michigan, Colorado, Delaware, Ohio, and Utah. They say no additional points were added for scenery, but I’m betting they caught a peek of the skyline over the Trinity at sunset. Money released its list of the best places to live in 2015, focusing on small cities that pack high wages, low home costs, steady job growth and excellent quality of life. Coppell ranks at the top nationwide Three cities in Texas made the Top 20 List. The states dominating the list included Connecticut, Minnesota, Ohio, Texas and Utah, each with three cities making the cut. Eight of the cities featured on the list were in the New England region, while four were in the Pacific Northwest. California, while having the largest population in the U.S., only had two of its cities featured. The city of Coppell was ranked as the No. 19 best city small city in America for working parents, according to the financial website NerdWallet.com. NerdWallet analyzed around 1,000 cities in the United States with populations from 25,000 to 100,000. According to the site, small cities were surveyed because they routinely offer the best environments for middle-class families. NerdWallet analyst Sreekar Jasthi said several factors played into the ranking. Jasthi said income and affordability, child care costs, quality of schools and the percentage of homes that had children were taken into account. Jasthi said Coppell earned high marks for the quality of education as Coppell ISD is continually ranked among the best school districts in the country. Coppell, however, does suffer from higher than average child-care costs, Jasthi said. Jasthi said the percentage of homes with children is a “sign of a healthy community,” and 46 percent of Coppell homes have children in them. Coppell, however, was ranked among the most expensive cities surveyed. While home costs in Coppell are higher, the median income for Coppell families is higher than the average. Jasthi said the average income for a family with at least one child is $62,000. Coppell was surveyed as having a median income of around $123,000. Coppell was the only Texas city in the top 20. Allen came in at No. 24, Keller was ranked at No. 31 and Sugar Land was No. 38.